Waking up at 11:33 a.m.
Steel Cut Oatmeal with Cinnamon, Maple Syrup, Strawberries, Maca Powder, and Kefir. Yerba Mate Tea. The cleaning bug hits me. Chucking a bunch of junk we had stored behind the washer and dryer. Random articles of clothing and useless appliances. Making more room on the shelves. My nose is clogging up from all the dust. At the Great Neck Rec for adult basketball. The first game is always the freshest. I knock down four 3-pointers and make two turnovers. My team starts off on a winning streak until the last game. Back home. 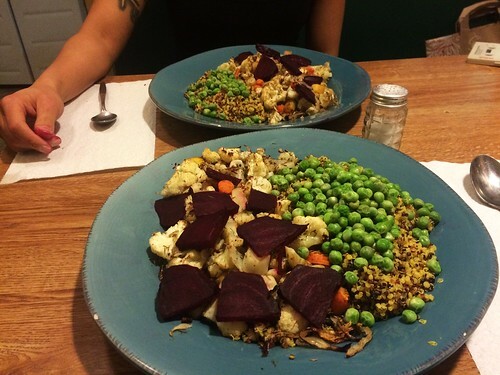 Ana cooked us dinner: Peas, Cauliflower, Beets, Carrots, Onions, and Quinoa. Sitting down with Ana at the table while she cries a little because of how overwhelmed she gets with keeping her room organized. She has existential concerns about her life and who she is. I tell her be strong and be grateful. It always seems like everyone else other than you has it all figured out but in the end we all struggle to keep our heads up and pursue happiness. At the music space practicing DEJA tunes – keeping up my chops.